As I made my way to Nathan Phillips Square at 9 am, it was like driving into a ghost town (not that I ever find myself driving downtown at 9 am but I know that it’s usually much more congested than this). But thanks to the dire warnings of G20 protests (peaceful and otherwise) most people stayed home. The square was very quiet as I scrambled from one trailer to another installing phones, modems and wireless routers. Every year Bell sends two guys – one to lay the cables and another to configure the high speed modems. This year, however, they deemed to send only one guy and he had his hands full because the locations of the trailers were all changed because they’re remodeling Nathan Phillips Square, so new lines had to be laid down under the massive concrete tiles that can only be moved by a fork-lift. When I asked if one could be left open in case our guy needed to go back to the junction box, I was told that they were worried that some G20 terrorist would crawl under there with a bomb. Anyway, that whole G20 kerfuffle made for a smaller crowd for Alex Pangman, who played a 5 o’clock show with some great players including a couple of friends, Terry Wilkins and Jesse Barksdale. 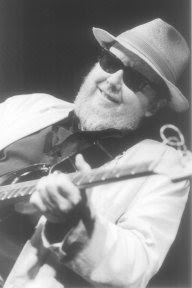 I don’t think I ever saw Jesse playing a “flat-top” guitar (as opposed to the vintage style archtops he usually plays) and even the headliner, Maceo Parker, whose fans would have fought their way through a police barricade to hear him, had a smaller audience for sure. And what a demographic he has – his appeal stretches from the young funk fanatics, who probably listen to rap and reggae the rest of the time, and old folks like me who grew up with James Brown. And I have to say this was just about as exciting as seeing a James Brown show in the 60s. I remember watching the James Brown Band (minus James and Maceo) rehearsing for a Blues Brothers movie shoot in Toronto a few years back. James wasn’t there but each song was performed, with all James’ signature moves, by a different member of the band, or roadie, or someone who was part of the entourage. They went through the entire show without James but it ran like a finely tuned machine. I never saw James when Maceo was in the band. Maceo has been well brought up. His show builds and builds then drops down with a whack on the snare drum (Michelle refers to this as an “Apollo”). You got the feeling he would play all night if they let him. A couple of times he just started singing some silly Streisand song (unaccompanied) for a few bars then boom, then the whole band would kick into another funk number. Take me to the bridge! Maceo was so generous with his band members – everybody got a feature spot (or two) and they all shone spectacularly – I guess that’s why he gives them the air time. And he repeatledly acknowledged his band and all the sound crew and stage hands as well as his English-accent lady manager who was omnipresent off (and sometimes on) the stage. I got to chat a bit with his long-time guitarist, Bruno Speight, who gave me some tips on playing that choppy funk guitar (it’s all in the upstroke). He also recommended I check out a gospel singer called Kim Burrell who he thought I would enjoy. He is based in Atlanta and I guess she is too. Two other shows going on at the same time were young Nikki Yanovsky and still pretty young Martha Wainright. Both had sold out shows. Lori Nuic, who opened for Maceo is also a talented up and comer. She was playing some wicked slide guitar during the sound check but what I heard of her set was sans slide...in fact she never picked up the guitar for the part I heard. Several people commented what a strong show she had – I look forward to seeing her play a whole evening sometime. One of my Campfire regulars has been working with her and said he would bring her down to Highway 61 one of these Tuesdays. The event in Shelburne is called One County, One Book where everyone in the county of Dufferin was invited to read the same book and now there will be a reading by the author. I’ve been invited to play a few songs about the Eastern Townships because the author is Louise Penny, who lives in Sutton, Quebec – my old stompin’ grounds. I just realized last night that I have a great song with a little bit of Eastern Townships lore, the Outlaw of Megantic. I haven’t performed it in years because I could never remember the words – there’s a lot of them. But I realized this is the perfect song for this event so I must remember it. I hoped I might have the lyrics on my laptop but no luck. Then I was starting to think who in Orangeville might have my first album. Not the folks I’m staying with. Anyway, the human brain, even a under-used one like mine, is a wonderful thing and most of the lyrics have come back to me over the last twenty-four hours. I was even dreaming about this song! I’ve been reading Louise Penny’s book though I doubt I’ll be done in time for the show. Hope no-one reveals the ending (it is a mystery- set in the Townships, of course) Call 519-925-2600 for reservations. Accidents, Thefts, Allergies, what next? 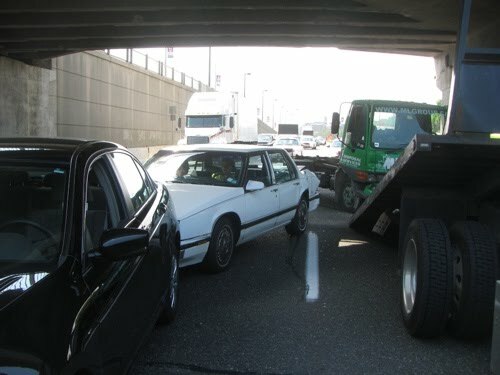 Here’s a picture of the Buick “sandwich” on the Gardiner expressway on Monday afternoon. I was returning from a judging session at the Niagara Music Awards (man, there’s a lot of talent out that way) when I got rear ended by one of those trucks that picks up containers at construction sites. Sure am glad I didn’t have the guitar in the trunk. Then again, I’d rather be playing one of those award galas than being a damn judge. As previously reported on my blog, my portrait at the Silver Dollar Room was stolen (right off the damn wall). Gary Kendall tells me I have now joined the select group including Donnie Walsh whose portraits were deemed worthy of being stolen. The bummer for me is that we were never able to find the negative for that shot – one of my favourites (and obviously someone else’s…) and I don’t even have a decent print that I can scan for a hi-res shot that can be used for print. It’s still fine for web, and you’ll see an interesting animated version on myspace/brianblain. But we all know the importance of having a hi-res! 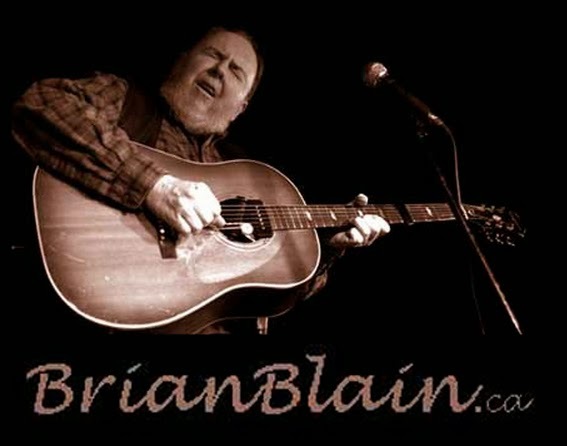 Keep an eye out for that picture – there will be a reward…how about a Brian Blain CD? How about two? We’re still doing it every Tuesday at Highway 61 – it’ll be a year in July and I’ve only missed one Tuesday, though this Tuesday I was playing with a pretty sore neck. I love it when we can re-ignite the spark of music in someone and this time it was a fella that had not played in 37 years but some of the campfire buddies convinced him to get up and play the bass for a tune and he got through it OK. On his way out he said he was going to get his old guitar out of the case – I think he said it was a Larivee - and that he’d be back. I hope so. There was also another guitar prodigy, 11 years old, who ripped off some solid solos but was having trouble following along the chord changes. He told me afterwards he doesn’t play the “B” chord. I told him if he was going to be playing in “E”, he better learn “B”! We had a campfire at the Gladstone Hotel last Friday as part of the Toronto Blues Society’s 25th Anniversary Celebration. There was lots going on and the campfire room was tucked away so we didn’t get a lot of traffic but had a great time with Bird Stafford, Robin Banks, Son Roberts, Norm Robinson and Mr. Rick. There was also a mystery female vocalist (best kept a mystery) who joined us at the end. At that point, she actually turned off all the lights in the room and we really had a campfire vibe going – playing in the glow of my ersatz campfire (note to self: get replacement lightbulb). One of the highlights of the Gladstone was an Iranian (excuse me, Persian) guy who I engaged in conversation because he had a hat that said “Piedmont Blues.” We talked a bit but before I could tell him I played blues myself, he said “I know who you are and I’ve got your CD and I love that song “Blues is Hurting”… Well, make my day! Well speaking of anniversaries, it must be damn near 50 years since I got my first guitar. I think it was the summer of grade 8 – I worked as a soda jerk and saved up $35. To buy a guitar from a friend. Next day I was in a band but what they needed was a bass player, so I just took 2 strings off the guitar and played it like a bass – with Band-aids on my finger tips to keep them from bleeding. It occurs to me that over those fifty years I probably still haven’t accumulated 10,000 hours (as they say) because I’ve always done other stuff besides playing but there’s a certain “naturalness” that develops when you learn an instrument slowly and I’m thinking about what Terry was saying last night – how what he noticed playing with lots of the older blues artists (and he’s played with some greats) that the one thing they had in common was they never played anything more than what was necessary for the moment. Sometimes it might be flashy and sometimes very simple but it was always what the song needed. I think I announced we were going into the studio in my last blast, but I pulled the plug at the last moment because I was not feeling ready. And I don’t think the songs were ready, since they’re still coming out different every time I play them. I won’t wait much longer. Missed the deadlines for the recording grants, but they usually go to folks whose career is mostly ahead of them, not old guys like me. Still, it's going to be 5 years and I've been feeling the pressure. A recording fund is in place, thanks to a couple of generous benefactors... you can deposit directly into account 00646842698006400101 at Alterna Savings and Credit Union, Danforth Avenue. (or talk to me). I've got a new batch of songs - well not so new anymore - and the good news is that I've been out there playing them for different audiences and with different accompaniment. I had pretty well decided to make an acoustic album and I had talked about it with some of the top bluegrass players in town, but then I did an abrupt turn and decided to make it a band album and now I'm right back where I started, except in the process I've come out with new (bluesy) arrangements for some of the more folky tunes. I'm now back to recording alone at home and fine-tuning some of those songs. I guess it can't hurt. Stay tuned. That first week-end of the festival (with all the G20 activity going on) I have to extricate myself on the 26th to do a set at the City Roots Festival at the Distillery District. It’s at 6 pm on the Mainstage. I couldn’t hang around very long because I had to go play at the Italian restaurant – it’s run by a colorful character who’s an ex boxer and a fabulous cook. Great food and hospitality at this gig, at the home where I’m billeted and throughout the whole town. One lady from a venue I played a few years back recognized me and said hello. A few other folks remembered me from gigs in this area. I thought I was finally going to get to sit back and hear the elusive Bharath and the Rhythm Four from Montreal but everything conspired against it. Costa, the bass player had a dislocated should, the venue was packed to capacity with young people who just came to party and showed very little appreciation for this first-class outfit. Bhrath gave his bass player a break, picked up the guitar and invited a couple of local harp players, Doctor Nick and Shrimpdaddy, to play out the set. I don’t blame him but I just wish I’d heard him play more – and what a great voice. I liked his guitar playing, too, And then I end up leaving behind the CD that Costa gave me. I saw him the next day but I didn’t have the nerve to ask for another one. I’m going to buy the damn thang. I want to hear it! I also got to hesr Heather Katz for the first time – and that was totally not what I expected. She laid down some official blues, with the amazing Kevin Breit guesting and even playing a little guitar “a la Memphis Minnie”. Last week I went to a “Sistering”event at the Jane Mallett Theatre – mostly because I had a few band-mates playing. Regretfully, Colleen Allen couldn’t make the gig due to illness but it was still a phenomenal show. MC was the bubbly Elvira Curt who I listen to all the time on CBC Radio. She’s pretty funny and get get a little lewd, but nothing compared to the next female stand-up comic who was positively outrageous. But the audience of well(high)heeled overachiever women executives was loving it. 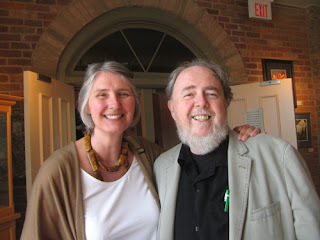 Evelyn Datl asked me to shoot some video – some of it may end up on you tube. I really wanted to get a shot of Donna Grantis stiletto-heeled foot pumping a CryBaby wah-wah pedal…and her radical new haircut. Thanks for reading. If you've enjoyed this Blainletter and you're not a subscriber, go to http://brianblain.fanbridge.com to sign up and get one every month or so. And if you "like" what I'm doing and you’re on Facebook, please click over to http://www.facebook.com/pages/Brian-Blain/70605028420 and make it official.